Yes, you can have your cake and eat it too! Not sure why anyone would want to have a cake they couldn’t eat, or how one would eat a cake without having it, but those troubling contradictions will no longer keep you up at night because as usual, Jester has the answer. No matter what diet—excuse me, lifestyle–you’re following, our certified nutritionist has carefully crafted a cake recipe that you can feel good about today. By “certified nutritionist,” I of course mean, “burned out college student.” But you knew that already. You smart reader, you. So grab those aprons and get cooking! You’ll thank me later. In a large bowl, combine ground beef with eggs. Add mixture to cake pan. Bake in an oven—meat loaf style. But this isn’t meat loaf. It’s paleo cake. Duh. Big difference. Remove from oven and allow to cool completely. Frost with coconut oil. Enjoy! This is the hardest step of the entire recipe, so be sure to give it your full attention and effort. Spiralize zucchinis. If you don’t know what a spiralizer is, shame on you. You’re not a real raw foodie. Blend bananas in high-speed blender. Combine spiralized zucchini and blended bananas in large bowl. Add mixture to cake pan and freeze overnight. Remove from freezer, sprinkle chia seeds over top, and serve. Remember, you are strong. You are virtuous. You are superior. Now, go eat yourself some raw vegan cake. I dare you. Consume ingredients at steady pace over the course of 1 Lord of the Rings movie marathon. In a rare moment of humility, I must veer credit outside of this illustrious publication. For those of you on a strict funfetti diet, you cannot go wrong with this recipe by Sally’s Baking Addiction. This is a woman who buys rainbow sprinkles in bulk, so you know she’s the real deal. 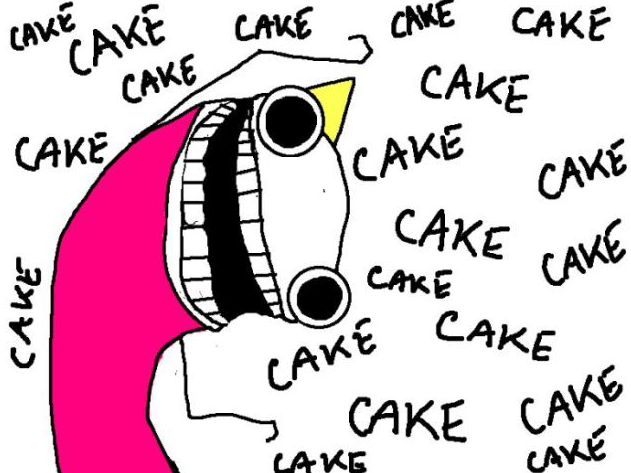 Image credit to Hyperbole and a Half by Allie Brosh (featured image as well).